Mr. Fvf and I have been going out for dinner much more often than we should lately. My longer hours and more grueling days at work make for a lousy housewife, but also mean finances are fast and loose, and we can basically dine out whenever we please. So - more reviews for you, but bigger front-butts for us. Can't win'em all. One of the many Fridays that I could barely keep my eyes open long enough to look at and dismiss anything in our cupboards, we decided to check out Los Reyes. It's always been hard for us to make it to a meal there. We either completely forget about it, or get pulled in by the tractor beam of Christopher's Restaurant a few doors down. I'd heard quite a few good things and not a single bad thing about Los Reyes, so I figured it was high time to get around to it. The hostesses were very friendly, but also very in violation of child labor laws. I would be shocked if they were a day over 13. Regardless, we were seated quickly and had our drink orders taken right away. The place was nearly packed, just as much as any other place would be on Friday evening during dinner rush. I obviously wasn't the only one that had either discovered or was hoping for a diamond in the rough. 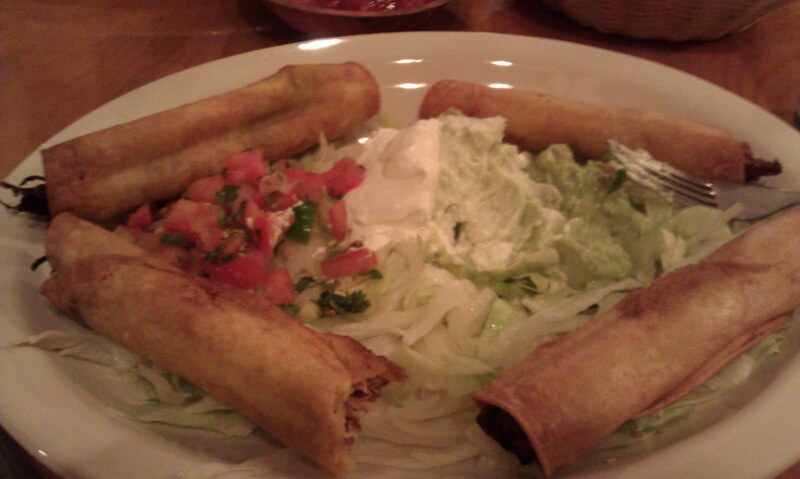 Their menu did lack a little bit in the "entrees not involving flour tortilla" department, so I stuck with my usual suspects, the flautas (two beef, two chicken). Mr. FvF went straight for the entree containing the most of his favorite sausage, Pollo con Chorizo. You'll have to excuse blogger for being a total dickweed today and not letting me align or justify much of anything at all. Due to that, I'm really tired of monkeying with this entry and I'll just give you a very forward opinion. Wasn't impressed. My flautas didn't even come with beans or rice. Almost everything needed more salt, or more seasoning. Must have been the blandest chorizo I've ever tasted, and I'm almost certain that they used flour tortillas for my flautas regardless of what the menu stated. The price was right and the service was good, but the food just wasn't impressive. It wasn't bad, but it certainly wasn't great. 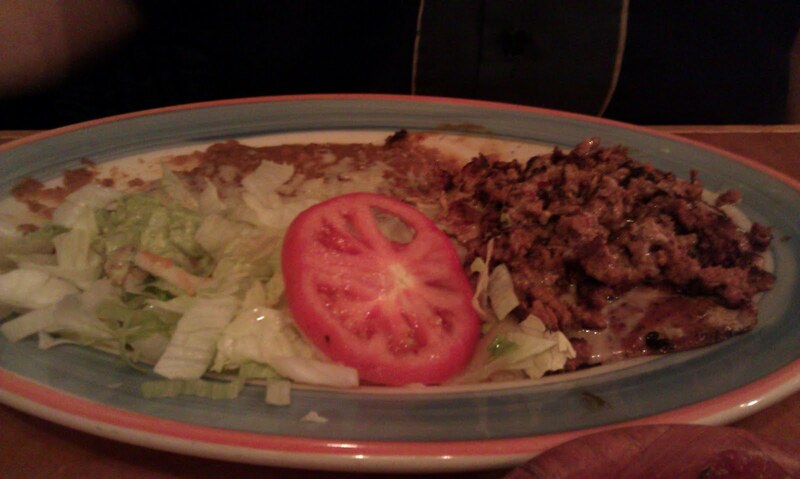 We'll probably stick with our old favorites next time when it comes to Mexican food. 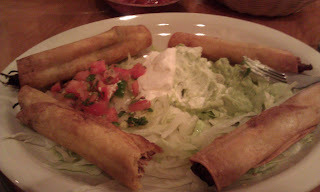 Small note - I believe the flautas on the the Los Reyes menu are listed as an appetizer item. Hence, the inclusion of beans or rice should not be expected. They are a menu favorite of mine.